An often overlooked aspect of designing a process is defining the who the decision maker is for directional decisions. When it is not clearly defined as to who has the final say then a lot of waste occurs. Decisions are made by the wrong people that can cause rework later in process. Confusion can occur as to who someone should go to for a decision causing delays or decision not to even be made. A common tool I have been using for the last couple of years is RACI. Catchy isn’t it. R – Responsible – This is the person who does the work. Responsible for taking action. 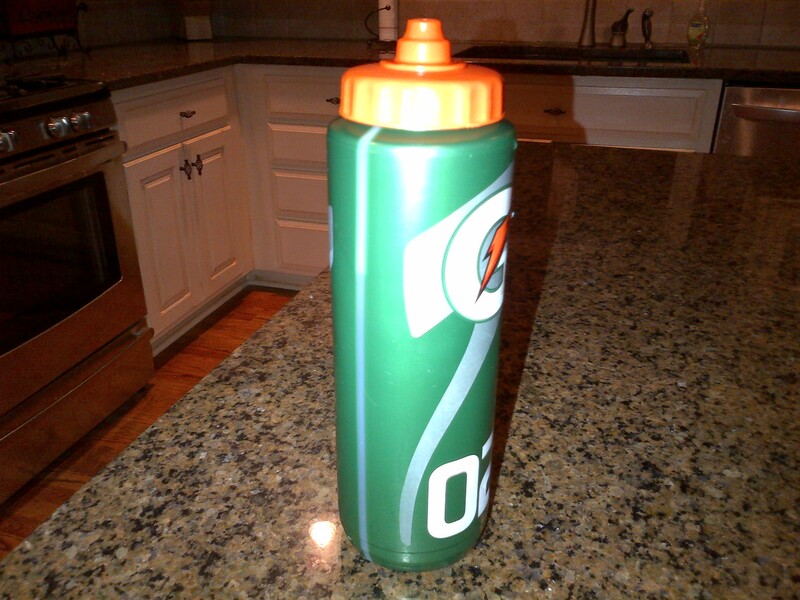 A – Accountable – This is the final decision maker. The “buck stops here” with this person. They own the work or project and have power of the veto. C – Consult – This is someone who is asked to give input to the action/decision. I – Inform – These are the people that are notified of what is being decision has been made or action will be taken. An example would be product development. R – Designers are Responsible for creating the product. A – Product VP would be Accountable for deciding the product will meet the consumer needs. C – Finance and Manufacturing Consult on what is cost and manufacturing feasible for the new product design. I – Distribution and Sales are Informed of the new product and when it will be ready. It is amazing at the efficiency a process can gain by defining and documenting the RACI for decisions and actions that are executed in a process. Have you clearly defined your RACI? I want to thank everyone who participated in the polls about a month ago. The information helped me learn more about who is reading the blog and what topics are preferred in order to drive to a higher satisfaction rate of the readers. Who is reading Beyond Lean? I suspected this may be the case. Part of the reason, I am a mid-level manager so my natural perspective is that of a mid-level manager. It is great to see so many senior level managers reading the blog also. What encouraged me the most was seeing the fourth largest group to read the blog was direct line employees (17%). I try to write so it relates to all levels and positions. Seeing the wide spectrum of positions reading Beyond Lean signals that we are relating to a variety of people well. Seeing the lean series week get a good response is encouraging because it was something we added this year. It seems it has been a success. Do people enjoy the posts on principles/concepts/tools because the posts help the reader address something they are working on and how to apply it? I hope that is at least part of the reason. We strive to make the posts applicable and easy to relate to. The feedback does not mean we will stop posting topics and features that rated low. The feedback allows us to focus our content. If you have any other feedback on how to improve the content, please leave a comment. One thing that seems to come up a lot in terms of continuous improvement activities is the need for data. Sometimes there isn’t the right data, sometimes there isn’t enough context to the data, and sometimes there just isn’t any data recorded at all. I’ve written about data in terms of metrics and measurement systems before, but this time I’m more talking about getting your hands on information that becomes clues to solve your production mysteries. I don’t believe in substituting data for observation, just in using it narrow the observation lens. So…what are some of my key thoughts for getting data to make sure you are working on the right stuff? First, make sure your data tool can tell you what you need to know. If it’s a log sheet of some sort, does it capture major sources of variation such as time, position, cycle, machine, tooling set, etc.? If it’s a measles chart (or concentration diagram or whatever name you may use), can you really tell the difference in defect locations on it? Next, be willing to sacrifice some clarity in some areas to get an overall picture of the process. I like to start by targeting about 75% of the data that I’d like to have and adjust it from there if need be. Most of the time I find that the extra detail I thought I needed wasn’t really necessary at this stage. I can always build additional data collection if I can’t get what I want from the reduced set. Also, try to make it as easy as possible. If you can extract what you are looking for from existing shift logs or quality checks or some sort of automated means, go for it. Adding a layer of work can sometimes lead to reduced data quality for everybody! To go along with the previous item, remember data isn’t usually free. If you don’t need the data collected indefinitely in the future, set an expiration date on the activity and free up the resources. Lastly, to paraphrase myself, data isn’t a substitute for going to the gemba and seeing the problem for yourself. Double check the data against what you are seeing with your own eyes to make sure that it can really help you. This data won’t solve problems for you, but it can help you know which ones are the biggest. I’m sure there are some other key points that I’ve left out, but there are a few for starters. Now, I’m sure some of you are asking, “Why waste time on this and why not just go observe the process at the start?” Good question. I think this is more of a helping hand to make the best use of time for some operations. If there are limited resources (and who doesn’t have limited resources? ), deploying this in advance of a deep dive can help speed up the search for solutions. If a process has a long cycle time or unusual frequency, something like this could help identify repeat issues vs one-offs. I am always looking for the best way to use what I have at my disposal and sometimes it doesn’t fit the textbook methodology. Waiting on others is a mindset I have experienced that causes things to stall out or never get started. A lean tool/concept I commonly see this with is strategy deployment (Hoshin Kanri). In an ideal state strategy deployment starts at the highest level of an organization. The executives would roll their strategy down through the entire organization to the front line level. This would create alignment on what priorities and how work is done across the entire organization. How often does strategy deployment start with the executives? Not often. Regularly people sit around waiting and wishing their boss or the executives would start the strategy deployment process. Waiting for this to happen is not an effective way to get strategy deployment started within an organization. The most common way to start strategy deployment is at some middle level of an organization. Develop the strategy for your span of control in the organization and roll it down to your direct reports. Then use that strategy to reach out to your business partners (where necessary) to get buy-in and help with achieving your strategy goals. As you become successful in doing this, more and more people will take notice. It will start to grow organically across the organization. Watch it grow. It may take some time but eventually, you may see the ideal state in your organization, but chances are the effort will have to start at a lower level. One of the lean principles I use is directly observe work as activities, connections and flows. This sounds like a principle that would be easier to change. In an environment where the deliverable is physical and moves between physical work spaces this principle is easier to live. An example would be a manufacturing environment, where a widget is moving from machine to machine. Is is easier to take the principle literally and go out and directly observe the widget. A person can see the widget and the changes made to it. Lean is not just applicable in these type of environments. Lean is applicable in a transactional office or service environment as well. This does not mean directly observing work is not possible. It just means it is harder. In a transactional/service environment you can sit with the person doing the work and ask questions as they do the work. You will be able to learn a lot on an individual basis. What if a group needs to learn and wants to observe? It is really hard to cram multiple people into a cube or office…believe me, I have tried. 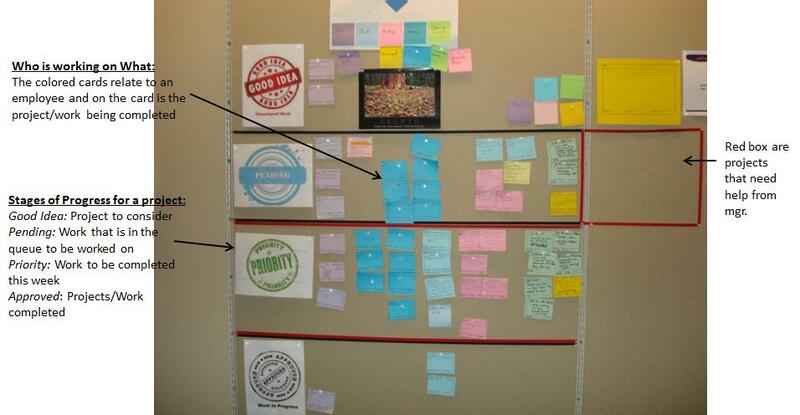 A different way to directly observe the work as activities, connections and flows is by creating a visual map of the process on a wall. There are many types of maps and ways to map. That isn’t as important as getting everyone to have a common understanding of what is actually happening. The deeper purpose of directly observing work is to gain a thorough understanding of what is actually happening. Not just one person. Every person that is necessary must have a common understanding. Reports can’t do that. Neither can sitting behind a desk. There may be other ways to directly observe the work. What is it you need to know? What don’t you know/understand about the problem or process? Once you understand what you need to know then you can determine how the way to gain that common understanding is for your situation. How have you gained a common understanding around a process or issue? I can be stubborn sometimes. I know. It can be a negative trait sometimes as a person trying to create change. But it can be a positive too. One way I have been stubborn is refusing to get a Masters degree in business. As a lean thinker, the typical masters program teaches so much of what I don’t believe that I couldn’t bring myself to want to pay to listen how standard costing is the holy grail of business. I had a friend tell me that it would be good to learn the other side in order to present lean even better. Deeply understand both sides. Great point. Even got me thinking about it. Then I heard colleagues that did that and ended up arguing with the professor the entire time which caused the class a lot of angst. Knowing how I would probably do the same I didn’t feel like it was a good use of money to go and argue with a professor. Why waste the time and money getting upset? I could use that money for something that won’t make me upset…like a vacation on the beach! I have felt that way about a masters program for a very long time. Until a couple of months ago. Jon Miller posted on his Gemba Panta Rei blog the start of a new masters program. Boise State University will be working with the Kaizen Institute to conduct a 12-month Executive Master of Business Operational Excellence program. What makes this program different? It develops a business leaders thinking in continuous improvement through six sigma, kaizen and lean. It is not the typical standard costing finance classes. The finance classes focus on value stream costing and new methodologies to look at cost. If you have ever thought about a lean masters program, I encourage you to check out the website (here). It looks to deliver fantastic curriculum in a unique way. A couple of weeks ago during the Lean Series week, a comment was made on one of the posts about showing more examples of visuals used in the office. That was a great question. Below are some ways visual management has been used in the office area. The column on the right shows the tasks that must be done each day by the managers. When the task is completed they put a check mark in the box. There are 4 managers in the area every day so there are 4 columns under each day. 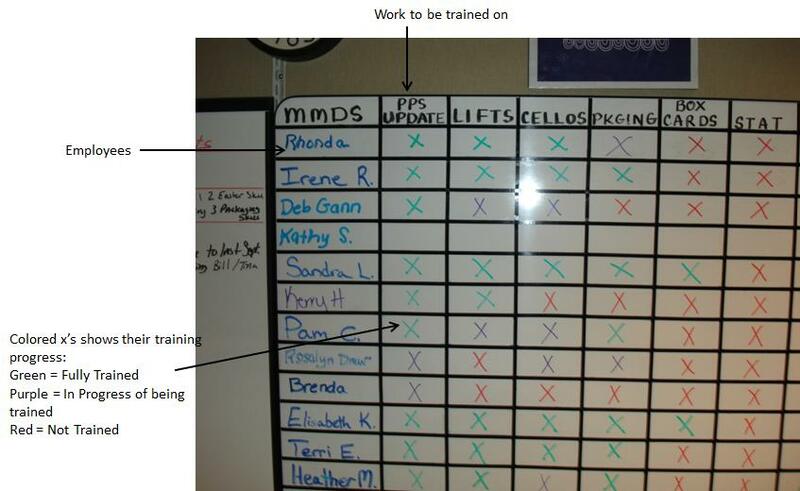 You can see that one manager is in a kaizen event all week so they put kaizen on the board to highlight the situation. 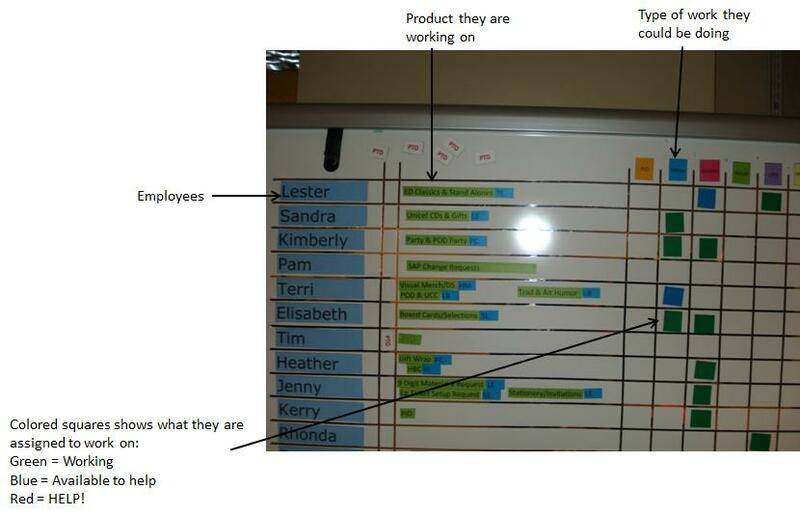 The above picture is a board displaying which employees are working on what work for that day. The manager updates the board every morning. The green square shows where that person will work that day. If an employee finishes their work they put a blue square showing they are available to help. If employee needs help, they can put a red square up. This has eliminated a lot of startup time in the morning when employees were trying to understand what work they were needed on that day. This visual training matrix board supplements the visual scheduling board. This board shows who is fully trained in what skills. Green ‘X’ means they are fully trained. Purple ‘X’ means they are in the progress of being trained. Red ‘X’ means the employee is not trained to do that work. 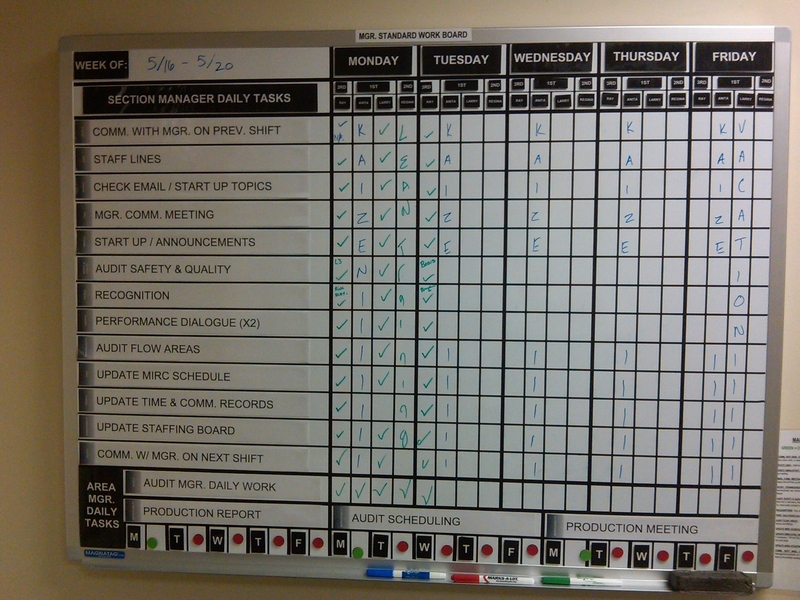 The manager uses this board to inform who they can have do what work for the day on the board above. This is a typical way visual management can be used in the office. It shows the progress of work through stages of the work. Depending on the type of work, the stages work goes there can be labeled differently. For software development it could be Design, Develop, Test and Deploy. I hope these examples spur thought on how you can use visual management in the office environment. If you have any examples you would like to share please feel free to send them to me so I can share them wit the readers. I have read studies and heard others talk about the lean perspective. Even more compelling, I have implemented and witnessed the lean thinking perspective be proven right time and time again. Traditional thinking of more inventory is better seems to make sense, but what happens is the inventory is never of the right product needed at that time. The economic scales of mass production says to produce a lot of the product when running it to minimize setup and overhead costs. Following this thinking means the company does not switch over and start to produce Product B early enough and is out of stock on Product B when ordered but there is an abundance of Product A in the warehouse. Lean thinking produces just the amount of each product needed so when it is ordered there is enough and overall there is less inventory. I watched as assembly line employees got upset because we took 80% of their component inventory away from the assembly line storage. The assemblers thought they would never have enough product to keep the line running. We explained they would have only 2 hours of component stock at the line and the line would never shut down. By the end of the third day, the assemblers were happy with the new inventory system because they had more space, but more importantly they had the right components at the right time. They reduced the time the line was down waiting on components by 90% compared to when they had a ton of inventory at their finger tips. This occurred one-by-one across all five assembly lines in almost exactly they same manner. Less inventory does deliver better serviceability and on-time delivery rating. 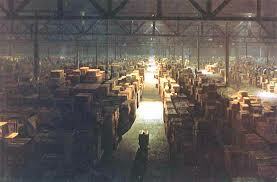 This does not mean just go out and reduced the inventory without a plan just to reduce it. It is being mindful of what is needed, when and how to get it there on-time. It is easier to see what is there when there is less. What is your experience with reducing inventory?